Metallic Rebel racked up several championships last year in the Derby Open classes, and his success is continuing as a 5-year-old with Equi-Stat Elite $3 Million RiderBeau Galyean in the saddle. The stallion added another title to his résumé during his time in Oklahoma by claiming the 5/6-Year-Old Open Championship. Galyean and Metallic Rebel (Metallic Cat x Sweet Abra x Abrakadabracre) were fourth to go out of 17 horse-and-rider teams, and they laid down an impressive run, which was worth a blazing 229. No one was able to top their score, so they sent home an $8,000 check to owner Thomas Guinn, of Philadelphia, Mississippi. This win brings the stallion, who was bred by Alvin and Becky Fults, to lifetime earnings of more than $225,000. 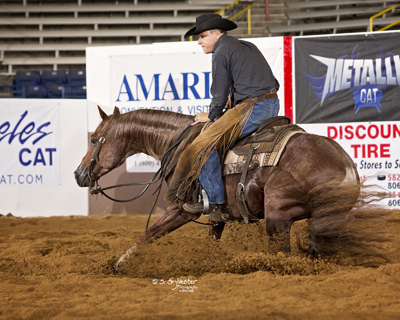 Metallic Rebel kick-started his 2017 season with a win in the 5/6-Year-Old Open at the Abilene Cutting Spectacular and then made the 5/6-Year-Old Open finals in West Monroe, Louisiana, at The Ike Derby and Classic. In 2015, he picked up three Derby Open Championships at The Ike, the Pacific Coast Cutting Horse Association Derby and the West Texas Futurity. He is the highest money-earner out of Sweet Abra, who was the No. 1 producing dam of cutting horses in 2016, according to Equi-Stat.